← A Glut of Cherry Tomatoes! Tomatoes, tomatoes, tomatoes! Do I sound redundant? We are picking, sorting, eating and breathing tomatoes! We see tomatoes in our sleep. It’s been wicked busy here at the farm. 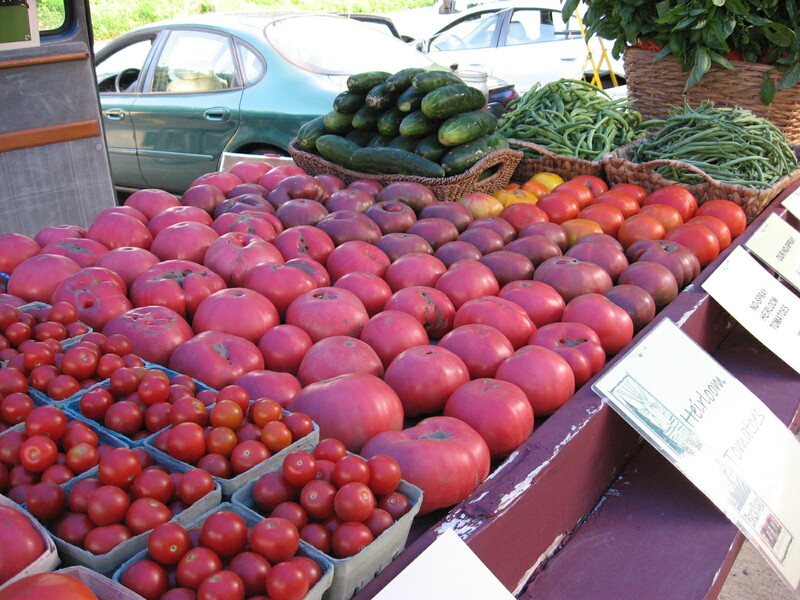 I’ve been going to market on Wednesdays and Fridays by myself, while Val stays at the farm picking more tomatoes. Saturday we go together as it’s non stop at market…one selling, one stocking. You would think we would have our fill by the end of the week, but not on your life. Now it’s time to put up the larder! We are roasting, dehydrating, canning sauce and chopped tomatoes, as well as making salsa, to be used during the late fall and winter months. It is a total labor of love and one of the things that brought us together….our time in the kitchen. Yet there is one thing that I make each summer that in my view is the reason for the season. 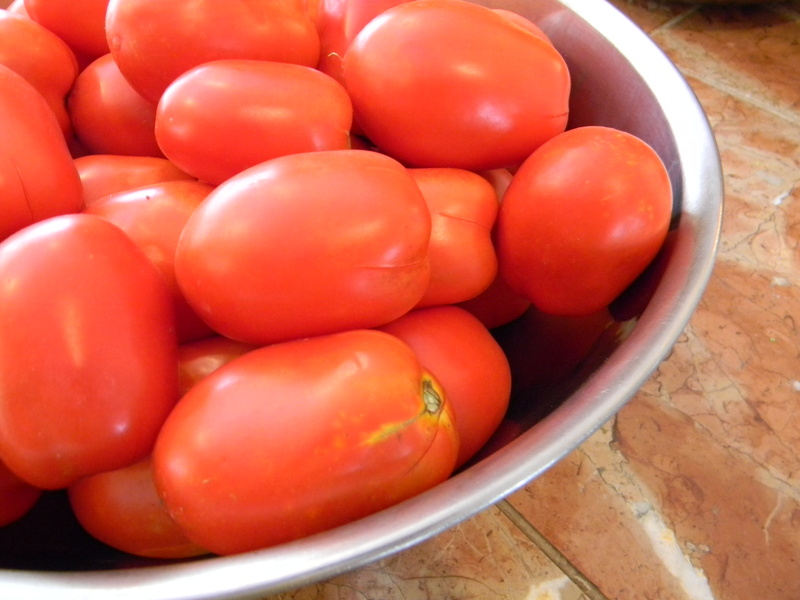 Just the thought of it will put a smile on my face and a song in my heart: Uncooked Tomato Sauce! I remember when I made it for the first time, about 25 years ago, how shocked I was by how just five simple ingredients could yield such an incredible flavor, but don’t be fooled! The paste tomatoes are just coming on, so I’ll make it as often as I can squeeze the time in to do it. 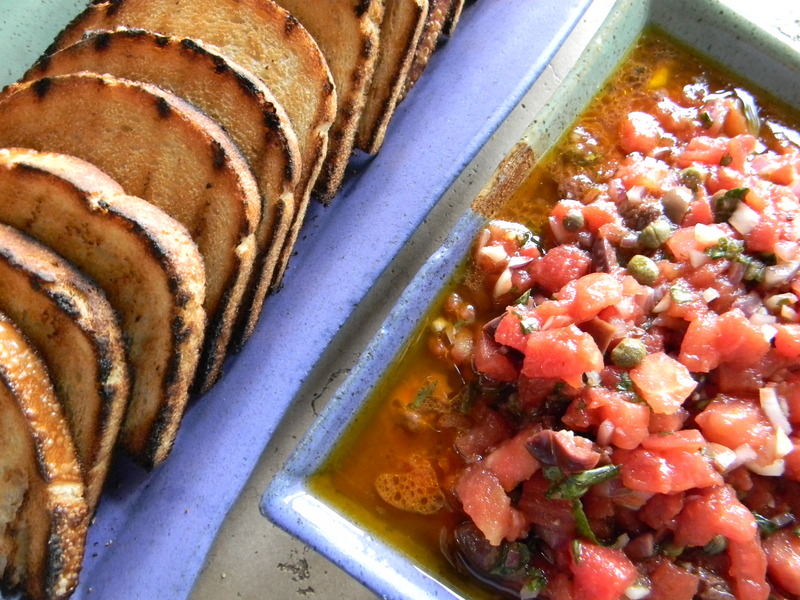 And since I’m doing something that is a little labor intensive, I’ll make enough to change some into bruchetta. On the days when the sweat is pouring off my face, I remember this is my reward! Put all ingredients except pasta in a glass or pottery bowl. Let stand a minimum of 4-6 hours for the sauce to meld. This allow for the salt to break down the tomatoes slightly and bleed into the olive oil. Boil pasta according to package directions, drain. Place in pasta bowl and pour sauce over warm pasta. Serve immediately with lots of crusty Italian bread to sop up every bit of summer! 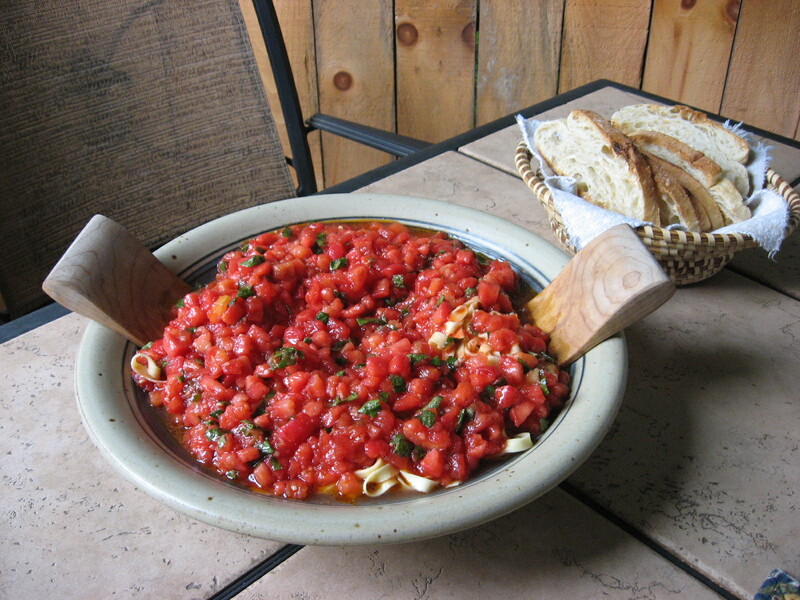 Spread on grilled or toasted French or Italian bread. Allow the juice to soak in. Good food is good for the soul! 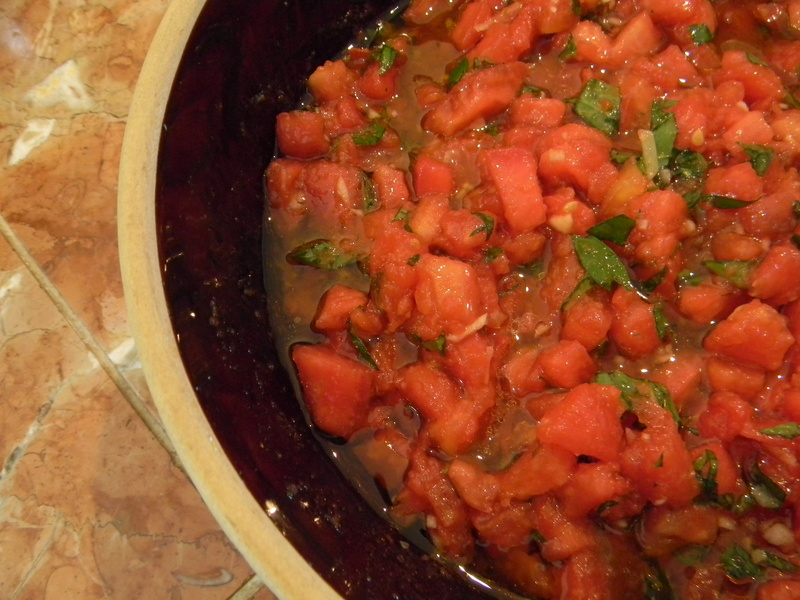 This entry was posted in Farm News, Raves, Recipes and tagged brickyardfarms, farm, food, garlic, raves, recipes, tomatoes. Bookmark the permalink. Swoon is exactly the right word. There is no. better. tomato. recipe. in terms of truly tasting the glory of a fresh tomato. This looks AMAZING!! I’ll try this for sure! uncooked tomato sauce?!?! genius! i’m going to include your recipe in our Eat Local Challenge menu, and send our co-op members to your fabulous blog! Oh my god, I adore tomatoes. This is my heaven. thanks for sharing! I love everything about tomatoes. Yum.